“Sixteen-year-old artist, Erin Van Horn, doesn’t know an Unagi Roll from a Kaiser Roll. But on a dare from her best friend, Tori Mukigawa, she wins a spot as an exchange student at a prestigious Tokyo high school. Once in the land of the rising sun, Erin struggles to learn the culture and deal with a host family from hell. Otosan, the father, stops speaking to her after she “murders” his favorite bonsai tree. The mother, Okasan, believes Erin’s evil because she’s left-handed and their son is an Elvis impersonator who is convinced Erin’s the spitting image of Priscilla if only she’d dye her blonde hair black, and become his child bride. 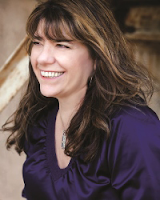 How long have you been writing Young Adult? I’ve been writing YA for five years. I love the genre. Seems I never grew up. Where you do you get inspiration for Tokyo Dare? I’ve lived in Japan, travel a lot, and met some amazing people. I’m a very curious person, which makes me wander off the beaten path. This usually leads to wonderful discoveries like secret temples and hidden neighborhoods, but sometimes leads me to some places I’d rather not find like the spot where the village people dump their jars of rotten pickled eggs. Yuck! What about your next book? Will it be part of a series or stand alone? Can you give us a taste to wet our appetites? I’m working on book two of the Sushi Chronicle Series. Erin has her dream boyfriend and is doing well in her second semester at Seda Academy. She’s even making progress on her crazy to-do list. She’s moving out of the host family from hell! But just when she thinks she’s settling into her life in Japan a string of events turns her world upside down. I’m working on the Tokyo Dare series and several other projects. I’m always developing new story ideas. My head is full of them. 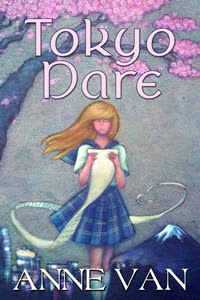 For more about Tokyo Dare check out these sites! Sounds exciting! I love the cover. Sounds like a great story and it was fun to learn more about Anne! Thanks Ann for stopping by Pretty in Fiction! Thanks Daniela! Tokyo is an amazing place you should go! Love the cover & great interview. Thanks for sharing. Kt Thanks for stopping by. Glad you like the interview and the cover! Eustacia I bet you have your own stories to tell about Tokyo! Thanks for your interest in Tokyo Dare!